It’s amazing how much an injury to a small area can hurt like the dickens! I recently fractured my right great toe by dropping a 25 pound weight plate on it (oh, the hazards of being a gym rat…) and have been dealing with a tremendous amount of pain from the injury. I had done the exact same thing (albeit with a 10 pound weight plate) on the left great toe back in 2002 and experienced pain in my toe for a full year, so I am dreading having to endure the healing process again. Driving has become a major hassle, because pressing on the gas and brake pedals loads a pressure on the extremity which radiates to my poor broken digit. I am now limited to wearing flip flops and a couple of pairs of athletic shoes with larger toe boxes which accommodate the swelling somewhat. I say somewhat because the athletic shoes I have worn have created nasty blisters on the top of my toe, creating a completely different type of pain which is stacked upon the deep bone pain. Oh what fun. When I shared the news that I had broken my toe, a couple of people had asked me if I knew it was broken, and one person kept yammering on about what to do to treat the fracture. I am a medical doctor who has seen more than my share of fractures, and I KNOW what a fracture looks like. What I don’t understand is how people can ask me if I know for sure, or how they can tell me I need to see a doctor for it. Rest assured, I am in excellent hands with my doctor: ME. 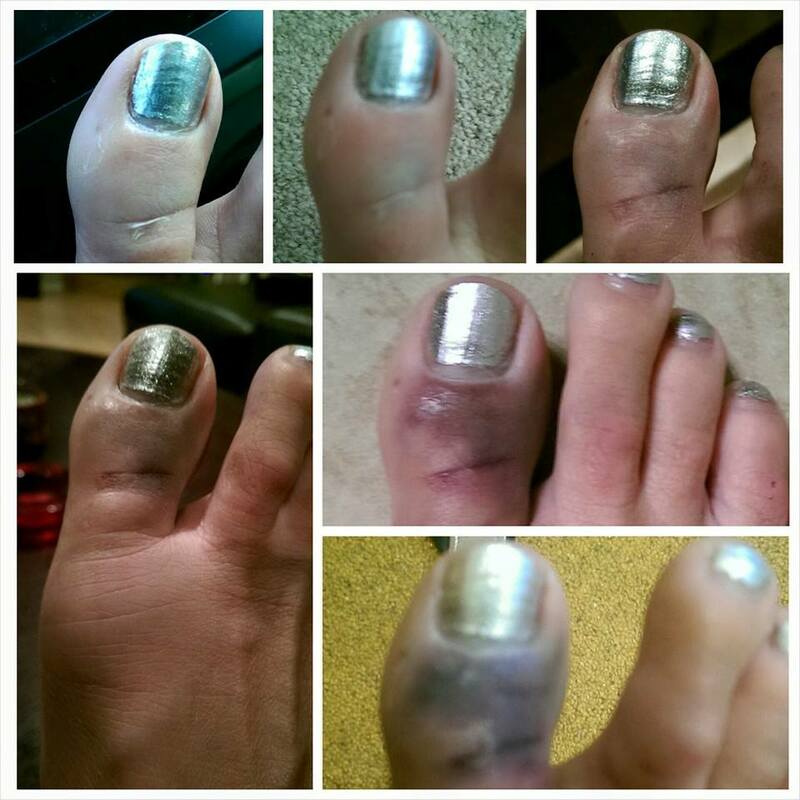 Here is a collage of images taken of my toe from 30 minutes post-injury to 36 hours post-injury. No X-ray will aid in the diagnosis, nor will it change the treatment course. Yes, it IS broken. This injury will definitely set me back with training and competing because I will not be able to perform plyometric exercises, treadmill work, calf work or lunges for a while. However, I will not be deterred from continuing to train around my injury, and will take this opportunity to develop a heightened awareness of pushing through the heel while performing exercises which target the glutes. Who knows, maybe this injury will be a blessing in disguise, a tool to help me round out a problem area?